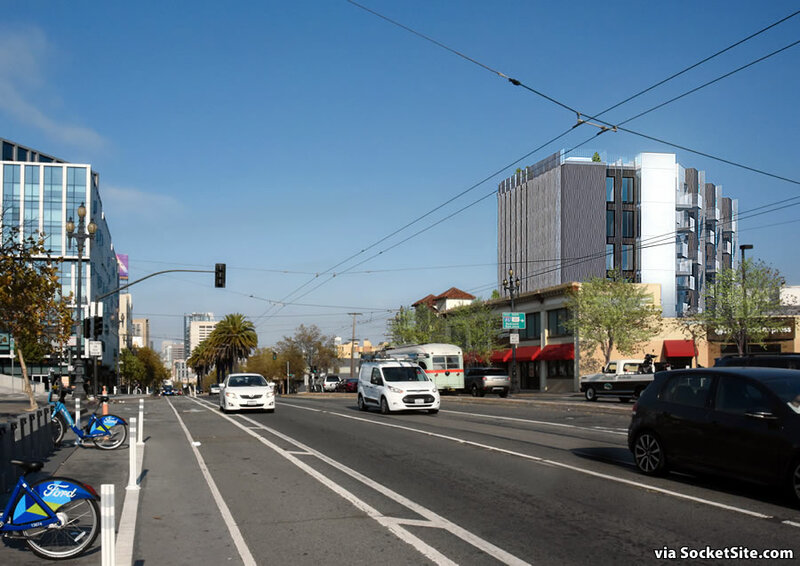 Having qualified for a streamlined environmental review this past November, the refined designs for a 96-unit building to rise up to 85 feet in height at the intersection of Market and Duboce, behind the historic façade of the former Gantner Brothers’ Funeral Home building at 1965 Market Street, could be approved by San Francisco’s Planning Commission on Thursday of this week. Once again, while the site is currently zoned for development up to 85 feet in height on the corner, it’s only zoned for 50 feet in height upon its parking lot parcel fronting Duboce, but the project team is proposing to invoke California’s Affordable Housing Bonus Program in order to build up to eight stories (85 feet) along Duboce with seven setback stories rising up to 75 feet in height behind the historic facade, as designed by David Baker Architects for Keller Grover Properties. In addition to the 96 condos (a mix of 52 one-bedrooms, 43 twos and a studio), 14 of which would be offered at below market rates (BMRs), the proposed development would yield 3,800 square feet of remodeled retail space and underground parking for 48 cars (including one space which would be dedicated to a car sharing program). 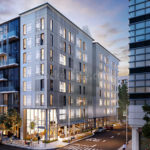 And while a number of neighbors are officially on the record opposing the project, citing potential environmental harm in the form of additional “traffic, chemical pollutants, noise pollution and increased temperature due to CO2 emissions,” the City’s Planning Department is recommending the project be approved as proposed. I love how that looks. The reasons from the opposition is ridiculous. “increased temperature due to CO2 emissions” – as opposed to all the CO2 that would be emitted by having these ~150 residents living in suburbia and commuting to the city? As opposed to all the CO2 emitted by the cars that currently park and idle in the woeful parking lot? Ridiculous. Handsome project. Too bad the developer can’t assemble the Pet Food Express lot and reshape the entire corner. 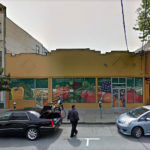 In my view, all the street level retail should be re-purposed to garden style apartments (which would be lovely in the older Spanish-style building) and concentrate the retail in the retail corridors (Castro/Market; Church/Market, etc.). This is not a good retail location. Fed Ex wants to return. Doesn’t change my view of street level retail. In my opinion, the BOS and Planning need to wake up to the reality of retail. We should have fewer, but more robust retail corridors, and stop requiring the developers to build retail at ground level that sits empty. Agreed. Look at all the empty retail along Market Street now. More is not going to help the situation. Planning calls it “animating” the street level, but the result has been street level death. Concentrating retail in a few areas is such a sensible idea, there’s no way it will be adopted by Planning. This is an excellent retail location! It’s right on Market, the city’s main street. In contrast, no one would want their bedroom level with a busy corner like that. Hey the concrete for that building when manufactured produced more CO2 than all the cars that might be generated by it, for years of driving. Carbon dioxide emissions and climate change. The concrete industry is one of two largest producers of carbon dioxide (CO2), creating up to 5% of worldwide man-made emissions of this gas, of which 50% is from the chemical process and 40% from burning fuel. So these people should be homeless to avoid the CO2 emissions produced by building new homes… ok. So what do you propose we do to produce more housing? Sound transfer in a tall wooden structure can be rough in a residential building. Cement producers in California offset their GHG as required by the Air Resources Board. There is currently hundreds of millions of dollars in the offset bank. One section of this building doesn’t seem to have any relationship design-wise with the other section. They seem somewhat visually discordant. Would have liked to see more integration between the two masses. They ignore each other rather than interact. I suspect that’s intentional. I’m not saying it looks good as is, but without this break in design it would be a giant monolith. You’ve got the parti! The intension is to have this read as two discrete buildings. BTW it wasn’t a good thing to make it one mass. We tried that and it was overwhelming to the historic building. DB: I think you got it right. My only lament is that I think the historic building should be homes, not retail, but also understand the requirements. In particular, the building that sits directly behind the historic building is very well done. Agreed. Clean, finely detailed, no gimmicks. The transparent parapet is a nice touch. Planning Dept. packet doesn’t include renderings of the south-facing side of the project (showing new construction with existing buildings on Clinton Park). Any chance you created one? Wow what a bland ‘could be anyplace’ design. We should arrange a mandatory architectural tour of the Netherlands, Benelux etc for anyone in Planning or planing to build in SF. what do you want, some bay windows? Bay windows? No! I want, I demand Permastone siding just like they have in the midwest on all the old clapboard shacks. It harkens to a historic bygone era. Seriously, my God there are some who can’t strain their brains beyond the inside of their own shrink-wrapped reality bubbles tossing out flippant ideas. I shudder when I think of all the money the designer/builder has sunk into this project, not to mention the time – enough to derail the project due to the shifting economic cycles we live under. Take into consideration that you’re looking over a currently empty lot (corner) and over a short, 2-story structure to see the side of the building. You can’t realistically expect an architect to create an extraordinary expression at the lot’s edge where it may one day (hopefully) be covered by an adjacent project of equal height. Unfortunately, this shows a lack of understanding of the City of SF planning, codes, etc. Do you not think that architects would like to be “crazy creative”? That is what they do. That is what they love. But the reality is that getting a project approved in SF is torture. The neighbors are more (uniformed) torture, so to actually get a project done, there is a default to mass-appeal projects. You want creative, get all the crazy NIMBYs to stay home, and elect a BoS that has some taste and is willing to change the requirements. I dig it very much. David Baker has been doing some great work—especially as of late and for BMR as well. looks good. how about taking the density bonus and getting it higher? Did you read the post? They are using the density bonus to achieve the heights proposed, otherwise it would be shorter. By SF standards it’s not too but it could have been better. The failure to integrate the new building with the old – as in doing something more with the roofline of the new building to complement that of the older building and doing more with the façade to carry over from the materials of the old structure – is unfortunate. The view up Market Street is a bit jarring. A better roof treatment could have mitigated that somewhat. Agree about the lack of need for more retail here. Someone suggested “garden apartments” at ground level which would have been nice. Again, these plans are not to scale – look how the eight-stores building is only slightly taller on the plan than the six stores. It should be shorter. The “professionals” on this site will cry “housing” – as it butters their bread. But high buildings are not wanted by most people in the city. high buildings are not usually wanted by people who already have homes — like you, i’m assuming — but alas, this is america, and people who own land have the right to build on that land. tyranny of the masses = housing crisis. Well I have a home and I want this one to be there too. It looks awesome and will continue the delightful contrast between new/old and large/small that’s already happening across from the Mint — cities are about contrast, people who want everything to look the same should move to suburban subdivisions. 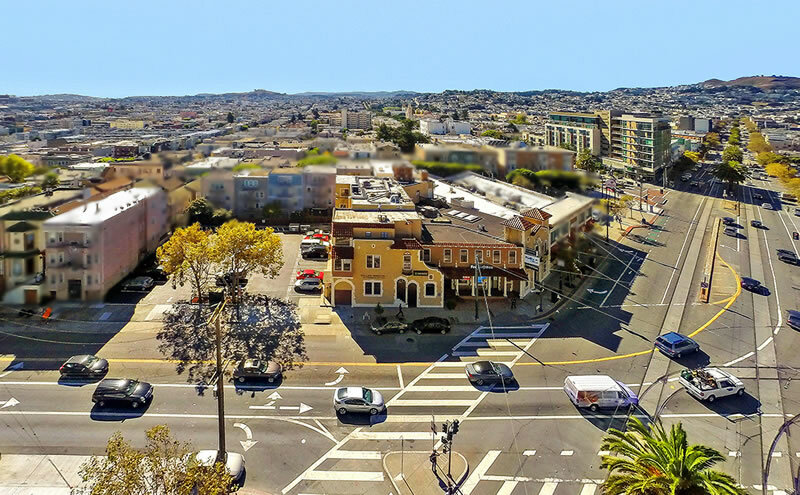 More neighbors will help retail and make that identityless area (is it Castro? Hayes Valley? what?) less boring. is 8 stories considered high for a city? I live here and I want taller buildings. Housing is too scarce, and taller buildings can accommodate more housing. Transit stops on Market will be more useful when they serve taller, higher density developments. Quite a juxtaposition w the 1870’s Victorians on 100 block of Guerrero, and definitely impacts everyone on both sides of sleepy Clinton Park alley behind, but that’s progress. The Taco Bell is also “quite a juxtaposition” to those older houses. 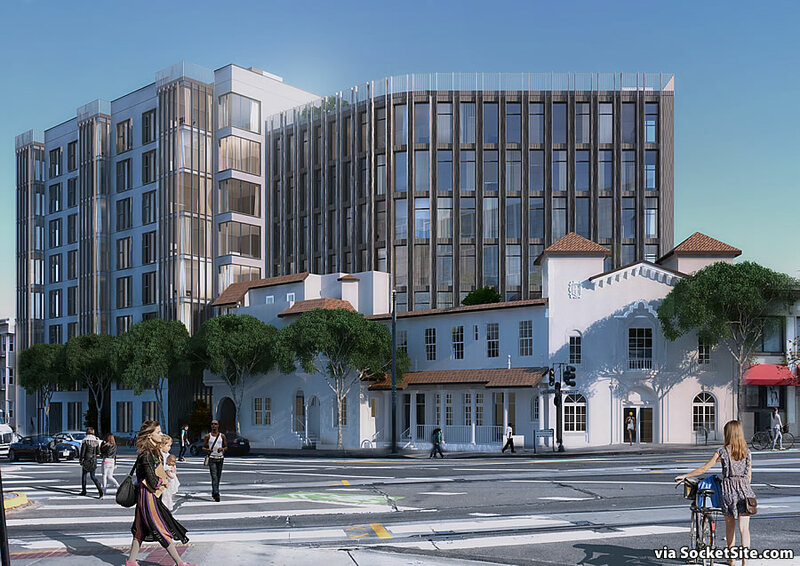 In any case this proposal is not on the 100 block of Guerrero, so the supposed juxtaposition is not any more relevant than that of the 7-story building at Market and Laguna or the modern 8-story building at 1844 Market.